LONDON • Japan will never again be considered a rugby joke after their three World Cup victories, including their historic shock win over South Africa, said outgoing coach Eddie Jones. The former Australia coach said his side's attacking style had inspired a new generation to follow the sport in Japan and they were now rightly considered heroes as they prepare to host the 2019 Cup. Japan ended their stunning England 2015 campaign by beating the United States 28-18 on Sunday. They became the first nation to win three group games but fail to reach the quarter-finals. The Brave Blossoms caused the biggest sensation in World Cup history by beating two-time champions South Africa 34-32 in their opening Pool B game. "Before this tournament, let's be honest, Japan were one of the joke teams. Teams would put out their B team against them and beat them by 80 or 90 points," Jones said. "To come to this tournament and win three out of four games is a super effort from the team. It just shows the quality of the players we have and how hard they've worked to achieve this." 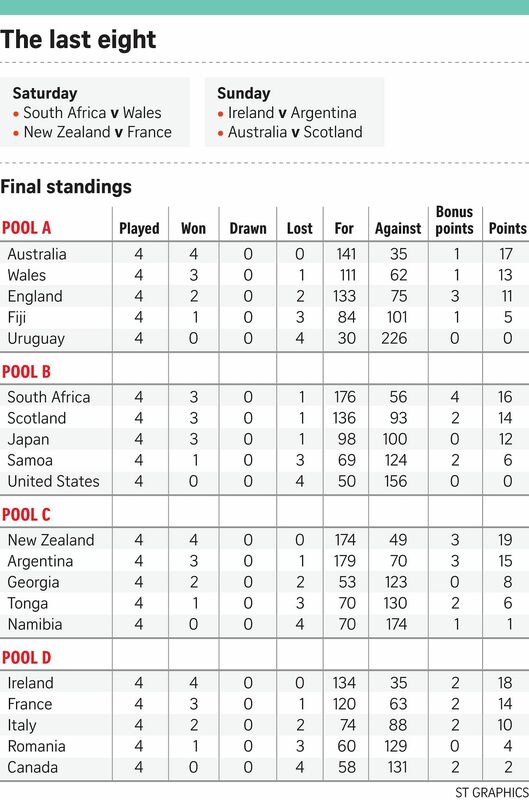 The Australian said if Japan were to go into the 2019 tournament with a higher ranking, they would face an easier pool and have a better chance of reaching at least the quarter-finals. "Maybe there were 30 million people in Japan watching the game," he said of the US game. "Thirty million is the whole of the Australian population, plus the kangaroos, plus many of the sheep. "Out of that 30 million, there's got to be parents who want their kids to play rugby. There are probably kids in front of the mirror now practising their goal-kicking. "It's a fantastic opportunity for Japan to have a new generation of rugby players, fans and heroes. These guys are heroes now. They've changed the whole image of Japanese rugby." Brave Blossoms captain Michael Leitch said, despite not being able to reach the quarter-finals, the team had decided to play their last World Cup match with pride. "We can show the world what we are made of and fans in Japan how wonderful this sport is. This is how we motivated ourselves," the 27-year-old back said.